Once upon a time, a rabbi brought a damaged Sefer Torah scroll to a conservator and asked if some small tears to the edges of the scroll could be repaired. The conservator considered the request and thought that maybe he shouldn't take on the job because, although he knew how to mend tears in parchment, he wasn't a Jew, so he offered to teach the technique for sewing together tears in parchment to the rabbi. But the rabbi wasn't interested in learning the technique, so the conservator offered to teach the technique to any member of the congregation, but no member of the congregation was interested. So, the conservator thought some more, and wrote to a rabbi in England who manufactured parchment for Torah, mezzuzot, and tefillin, asking for guidance. And the rabbi wrote back to say that it was not appropriate for a non-Jew to repair a Sefer Torah. One day, a member of the congregation found a sofer, a Hebrew scribe, in another part of the country, and the sofer agreed to restore the Sefer Torah. The relieved conservator agreed to remove the scroll from its wooden rollers and pack it for transportation. It was well packed, which was a good thing because while it was waiting for the sofer to begin work, a water pipe broke and the sofer's studio was soaked, but the scroll was protected and was not damaged. After a time, the scroll was returned, along with a few yards of kosher sinew, so the conservator could sew the scroll back onto its wooden rollers. Sefer Torah showing method of attachment to wooden rollers. So, one end of the scroll was tied onto a roller and as the conservator began rolling up the parchment the repairs made by the sofer were revealed and they consisted of parchment patches adhered with daubs of PVA, reinforced with wide strips of Scotch MagicTM Tape. Typical repair by one sofer, consisting of PVA, parchment patch and ScotchTM Tape. Another repair with PVA wicking through the tears, covered with Scotch MagicTM Tape. The conservator was upset by this and took photographs. When the Sefer Torah was returned to the congregation the conservator showed the rabbi the photographs and explained that the repairs were not good, but the rabbi was not upset. Only the conservator was upset. And I know that this story is true, because I was that conservator. About a decade has passed since that incident. Over the years, I have studied a bit more about the traditions regarding sofrim and the materials with which they work to create holy documents. As circumstances permitted, I have discussed my concerns with rabbis and Jewish scholars. A short glossary of terms used, and a bibliography of works consulted is given at the end of this article: I am not filling the article with footnotes because this is the report of a personal issue, not an academic treatise. The names of the individual rabbis and Jewish scholars I have consulted remain known to me and to them; their names are not repeated here because I do not wish to create trouble for them. There are parallel traditions in the Jewish and non-Jewish communities regarding the manufacture and preparation for writing of parchment and leather, and the manufacture of inks which extend back some two thousand years or more. 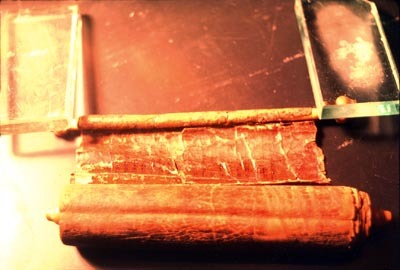 There is evidence that leather and parchment prepared by gentiles was acceptable for use in the production of sacred Hebrew writings, provided that that was the intent from the beginning of preparation, and it is known that gentiles were permitted to restore broken rollers, atzei hayim, upon which scrolls were rolled. One of the areas of difference between Jewish and gentile scribal practice has been the care with which the text has been transmitted. It is not uncommon for a scholar of gentile manuscripts to be able to determine the general time and place of origin of writing through an examination of scripts and spelling (or mis-spelling). It is one of the hallmarks of Torahs that they have come down through millennia substantially unchanged. Among Orthodox Jews there are two main divisions, Sefardic and Ashkenazic, and they have different scripts, but the words are the same. Torah is the word of God as given to Moses to write down for the guidance of His people, Israel. The written law. There was also an oral tradition, an oral law, which provides elucidation of the biblical text. In the centuries following the destruction of the Temple in Jerusalem in 70 CE, the oral law was committed to writing in the form of Mishna and Gamarah. Together they form the Talmud. The Talmud contains legal material (halacha) and legends (aggadah) woven together in a vast text. The Jewish Communities of Babylon and Jerusalem compiled their own Talmuds. The Babylonian Talmud gained the widest acceptance. The 12th c. scholar, Maimonides (CE 1135-1204) compiled the Mishna Torah. The Mishna Torah is a legal code. This code, or digest, was Maimonides' attempt at organizing a virtual sea of Talmudic knowledge into a form more accessible to scholars. The Mishna Torah includes rules for sofrim. It is by reading what he put in and interpreting what he left out that we can gain some understanding about the manufacture and restoration of a Sefer Torah. Writing sacred works is good; tanning hides and making parchment is not so good. People who handle dead animals, strip their skins, collect dung for bating skins, tan hides, make parchment, etc., are unclean. It is not surprising, therefore, that the average sofer would be unfamiliar, in a hands-on fashion, with the tanning of leather and the manufacture of parchment, so it was alright for a sofer to purchase materials from a non-Jewish tanner or parchment maker, under certain conditions. The words are the important thing. The earliest Torahs were written on papyrus, using an ink made from carbon black, pitch, gum, etc., a water-based ink, just as the Egyptians used. By the time of Maimonides, enough sofrim were using iron gall inks that he said it was halacha, alright. By that time they were also using parchment, not papyrus. Paper was known in the days of Maimonides, but it was not considered to be very permanent, and permanence was the keyword. If Maimonides had known how long well-made paper can last he might have said that paper was a suitable surface for writing Torah, and other sacred writings. But that's a tale for another day. The Mishna Torah of Maimonides states conditions of, and forms for, repair. There are two main forms of damage to the support (the parchment) and three mains forms of damage to the script. A page of text, a yeriah, is torn. If the tear extends into two lines of text on an old Torah it may be sewn up; if the tear extends to the third line of text of a new(er) Torah, it may be sewn up. If the sewing between two yeriot is torn it may still be used in services unless there are less than 5 (or 2) stitches remaining, depending on circumstances. Since my interest does not include repair to the script, I am not going to detail those damages and solutions. There is another form of damage affecting a scroll, and that is to the wooden rollers, the atzei hayim. Restoration of the rollers is something which is specifically permitted to a non-Jew. So. 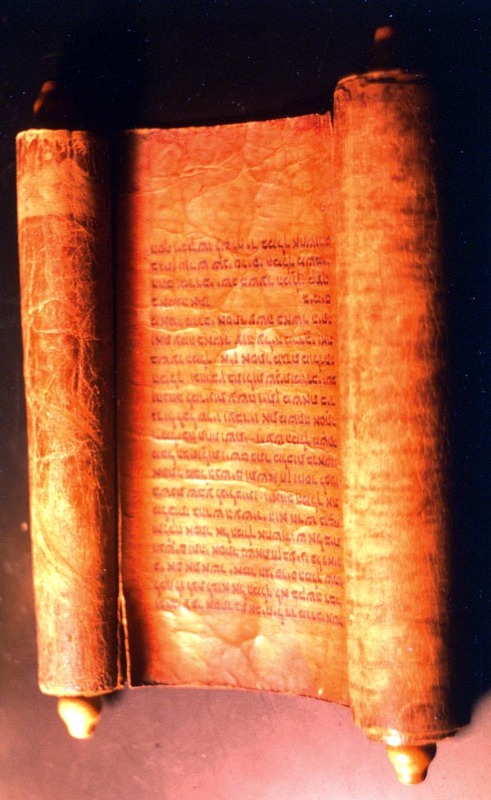 A non-Jew can tan the leather or make the parchment which will form the support of a sacred text and a non-Jew is permitted to restore a broken roller. But only a sofer can mark the lines and write the letters which convert an animal hide into a sacred document. Only the skin of a kosher animal can be used to carry the letters, and only sinew taken from a kosher animal can be used as the thread to connect the pages to each other and to connect the ends to the rollers, and to sew up the tears. 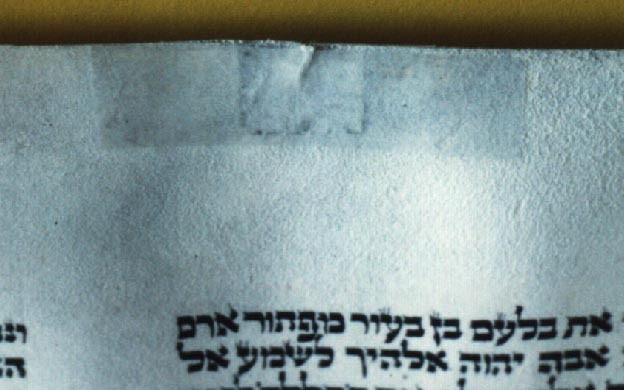 Only a sofer can make the ink and restore damaged letters. I understand and agree, with reservations, including the right to ask questions about the ink. Only a sofer can restore tears and re-sew the seams between pages. I understand, but do not agree. Let me explain. Earlier this year a private client sent a scroll of the Book of Esther (Megillat Esther) to the lab for conservation. This is also a sacred Jewish document, often reproduced in the form of a scroll. At some point in its history, the last leaf at one end had been lost so the owner(?) glued the entire following page of text around the wooden roller. This is an important text; the Jewish celebration of Purim revolves around the story of Esther. But it is somewhat less holy than the Torah, so I decided to restore it. The decision making process was similar to what I went through with the Sefer Torah, and while working on that scroll I began to think about what I might do if another Sefer Torah scroll came to me for restoration. Repair, joining two yeriot with green silk thread. I have decided that if a damaged Torah scroll is brought to me I will restore certain damages, subject to certain conditions. 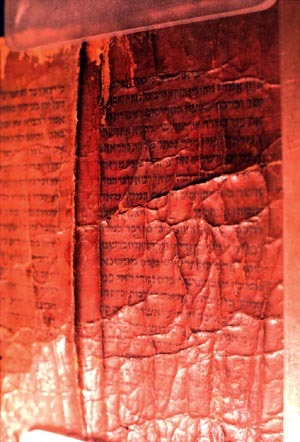 The damage must not affect the text; the damage may be broken sinew connecting two yeriot; the damage may consist of edge tears; the damage may be the loss of either yeriah connecting the Torah to the atzei hayim; the damage may be to the atzei hayim. Glued yeriah after removal of adhesive. 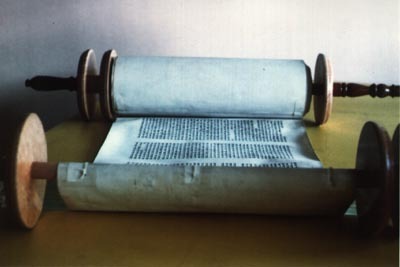 Scroll of Esther after restoration. No additional parchment was added and the wooden roller was not re-attached. The conditions are that neither the rabbi nor any member of the congregation be willing to learn the necessary techniques and be willing to conduct the repairs under my supervision, and that the repairs will be conducted in the synagogue with the rabbi present, using kosher material. But what about Torah scrolls which are owned, not by a congregation, but by a museum, or library, or private individual? 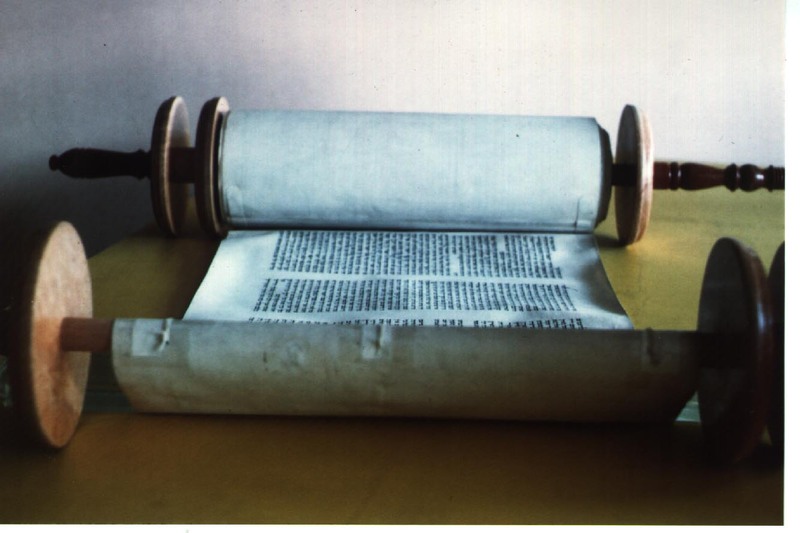 A Torah scroll which is no longer a living document, serving the needs of a Jewish congregation falls into either or both of two categories. It may be posul, in which case it should be buried, according to Jewish law. It may be restorable, in accord with Jewish law, tradition and practice, in which case the owner, whether public or private, should be encouraged to sell it to a congregation for a fair price. If it is not for sale, then I would restore it to the extent of the conditions listed above (except, of course, those related to a rabbi or member of a congregation). Over the past few years the movement toward political correctness has also infected the field of conservation and many people (including myself) have argued against restoring sacred objects from any culture other than one's own. I am no longer entirely comfortable with that philosophy. As this continues, the result will be a loss to mankind-at-large of artifacts which are emblematic of those cultures and much will be lost thereby. "Ukrainian Jews learn art of repairing Torahs" by Lev Krichevsky. The problem, how to repair Torah scrolls damaged by decades of neglect. The solution, training young Ukrainian Jews in the centuries-old art. The scrolls were confiscated by the Communist authorities during the soviet era. Now that they are being returned to the Jewish community, there is a shortage of people who know how to repair them. Earlier this month, Vivian Solomon, a Torah scribe and repairman from London, came to the Ukrainian capital of Kiev to teach classes at the Institute for Modern Jewish Studies. The institute, opened two years ago under the auspices of the World Union for Progressive Judaism, is training 10 young Jews from Ukraine's Reform congregations the basics of Hebrew literacy and Jewish ritual - including the restoration of Torah scrolls. The young men and women will then return to their hometowns to share their newly gained knowledge with their communities. Solomon, a 75-year old man of Indian descent, learned to repair Torahs eight years ago after retiring from his career as an engineer. "I love imparting knowledge," he said. "I've gained so much in the last eight years. When I die, it dies with me. I want to impart that to others before I go." Solomon has had to start from scratch. "Most of these students had never seen a Torah before they came here," said rabbi David Wilfond, leader of the Hatikva Reform Jewish congregation in Kiev. (C) Jewish Telegraph Agency, Inc., without permission. Engineer Solomon, whatever his attainments, is training/has trained men and women in the fundamentals of Jewish language and culture, and also how to repair/restore Torah. Solomon was passing his knowledge on to a Reform congregation. An Orthodox congregation might not be so willing to allow women to touch, much less learn to repair Torah. So, the issue is not how well informed and capable Solomon may be; the issue here, and it is central to my point, is that he was teaching techniques of conservation of a holy artifact to people who were at the same time learning the language and culture of a people for whom, at a certain level, Torah is as important as the air which gives life, and to which they were just then being introduced. Recently, as a result of Hurricane Mitch, a small Jewish congregation in Honduras saw their synagogue inundated by flood waters. They had two Torah scrolls. One was lost; the other was recovered and brought to a sofer in New York State for restoration, and it was reported for the New York Times by Anthony Ramirez. The sofer, who is also a rabbi with a day job, estimated that it would take approx. 5,000 hours of work over the course of two years to restore the scroll. The cost was not given, although the article did state the sofer's estimate that the work might require "$10,000 in materials and other costs". This does not seem, to me, to cover labor costs. Certainly not 5,000 hours of labor, even at minimum wage. The Honduran congregation consists of some 35 families (approx. 100 members) meeting in a converted three bedroom house. New Torah scrolls cost in the neighborhood of $20,000-$45,000. For the scroll. Wooden rollers, decorative covers, etc. are extra. The time required to write a new Torah is approx. one year. I leave it to fellow conservators with experience in estimating restoration costs to work through the figures. It is unlikely that the Honduran congregation will be able to pay the full cost of restoring or replacing a Torah scroll and it is possible that the rabbi-sofer gave those figures to the New York Times reporter to encourage donations from the American Jewish community, and it brings the issue of commerce to the debate. Yeshiva is the word for a school which teaches Torah to Jews. Some are at the grade school level, some at the high school level, and some are at the post-high school level. In these schools, and especially at the post-secondary level, students are introduced to the study of Torah and the commentary which has built up around Torah over the millennia. Academia at this level relates to Torah and the interpretation of Torah. At times, this study relates to the production of the physical artifact, the scroll of animal skin upon which words are written by sofrim, the ink, and the wooden rollers upon which the scroll of the Law is wound. The students are not expected to spend time with the sochet, the ritual slaughterer who kills the animals from which meat, skin, and sinew is collected. They are not expected to spend time with the parchment makers who soak the skins in lime baths, dehair them, stretch them in frames and scrape them clean. They are not expected to crush and soak galls in water to extract tannic acid, nor to dissolve gum arabic and ferrous sulfate in the solution of tannic acid to make the ink which is used to write Torah. Their task is to learn the Law. When they leave the yeshiva, some become rabbis, some go off to work in a profession unrelated to the study of religion, and some become sofers, scribes whose task it is to write Torah, and other sacred documents. Sofrim do not come out of yeshiva prepared for their work; they must apprentice themselves for a time, and they must pass certain examinations. Apprenticeships have twin goals: the perpetuation of skills, and the preservation of income through control of the labor pool. This is not an article about the guild system, but sacred or profane, if an artifact is to be restored, someone will pay and someone will be paid. The examinations are designed to demonstrate that the new scribe understands the Law and that he can read and write. The examinations are not designed to demonstrate a competency in the restoration of parchment. 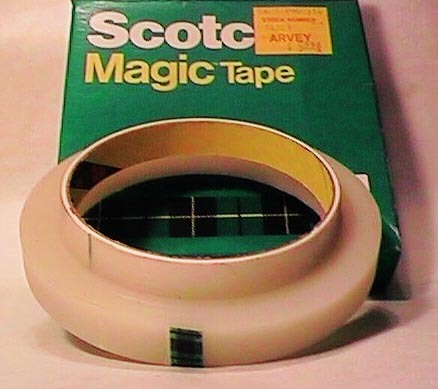 This is amply demonstrated in the difference between the injunction that tears must be sewn, and the reality that, in the instance mentioned earlier, tears were glued together by a sofer and that the glue (PVA) was reinforced with Scotch MagicTM Tape. If a Jew, of whatever persuasion within the broad context of Judaism, restores a Torah inappropriately, is that better/holier than a repair appropriate to the material being restored, but done by a conservator who may not be a Jew? I do not know which PVA was used and so, cannot assess how it will degrade over time, but I do know something about the tape. 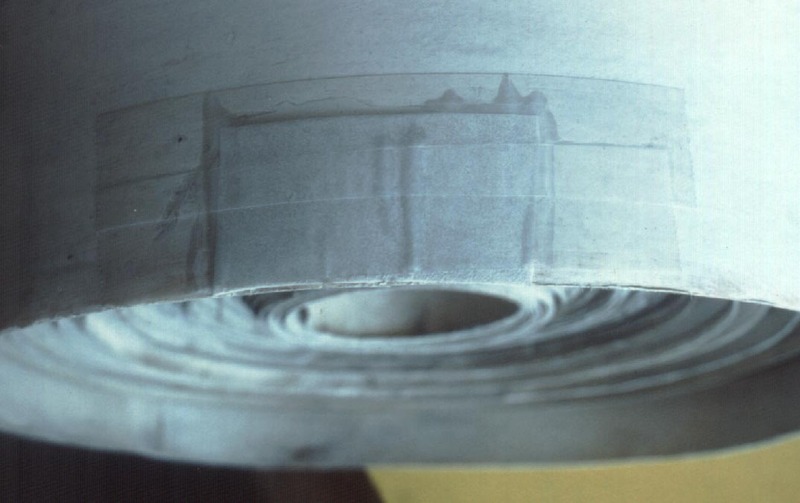 It exhibits adhesive creep, as illustrated in the photo. Over time, the adhesive will extend beyond the carrier and begin picking up dirt. However, the tape may be removed with little or no additional damage to the scroll. That may not be true of the PVA. How is this different from the old days when the janitor or curator at a museum was left to restore an artifact languishing in some dusty back room? Or, to paraphrase one of the individuals who reviewed this article, "The 'let Shlomo do it' school of Torah repair." In the back of my mind, while thinking about this problem, was the example of the Dead Sea Scrolls. Some of these scrolls and fragments are in non-Jewish hands, but some are in Jewish hands. Why aren't those items in a genizah? The restoration of the Scroll of Esther was not good, but from the evidence, I believe that it was done by an owner, not a sofer, and certainly not by a conservator. So, the question remains. Is it better to lose a document, or to retain the document in the service of a community, even if that means that a gentile's hands are the agency of restoration, in the absence of an appropriate restoration cabability on the part of those members of the culture who are entrusted with that responsibility? This question does not concern Jewish artifacts alone; it also concerns the sacred objects of any culture which is not the culture of the person performing the work which restores the object to, or for, that culture. I posed the question to an Orthodox Rabbi I know in Jerusalem. The question was also posed to a Conservative Rabbi in America; in addition, a scholar raised as an Orthodox Jew also reviewed and commented upon the article. The Rabbi of the congregation with the Sefer Torah discussed at the beginning is of the Conservative persuasion, and the congregation is (now) Reconstructionist. The Orthodox Rabbi in Jerusalem said: "I would suggest that if you don't find someone in the congregation to teach, that you do the repair yourself, and then send it to a sofer to 'check your work'. This gives him the possibility of correcting anything that went wrong from the religious point of view, and gives the scroll the Hasgocha (seal of approval) for the congregation." The Conservative Rabbi explained many of the reasons why it was not appropriate for me to do this work, and asked if I would be willing to help teach sofrim to properly restore Torah, within the framework of Halacha (and the answer, of course, was/is yes). He also mentioned a Torah Scroll which had been 'restored' by having a layer of latex paint painted on its backside. The scholar wished that such a question had never come up, but since it has come up, he agreed that, under certain conditions (basically, the ones which I stipulated earlier), it could be worse, and agreed, in essence, with the Orthodox Rabbi from Jerusalem. To me, accustomed to manufacturing parchment, making sinew, and manufacturing gold beater's skin, the mechanical aspects of restoring papyrus and parchment manuscripts are fairly simple and straightforward. To help the reader understand some of the terms used in this article, the following glossary may be useful. Some of these terms and their definition (noted with an asterisk) are taken from a book by Dr. Eric Ray, Sofer: the story of a Torah scroll , Torah Aura Productions, 1986.
the wooden rollers attached to either end of a Torah. basically a vault, or a protected receptacle, in which holy things which are posul are kept until burial. These, according to Jewish law, cannot be destroyed, but are to be treated with the same respect and care allotted the deceased; in certain historical cases, Jewish communities kept a Genizah for many years without ever burying the artifacts, books, etc. sinew taken from the thigh of a kosher animal and made into thread. Jewish law, judgement of legal status. rabbinic kosher supervision. A trademarked seal of approval can be granted by one the several agencies certifying the kosher status or a food or ritual object. A training manual for sofrim. Two of the three scriptural sections which comprise the Shema are placed in a container which is attached to the doorpost of a Jewish home. unfit for use; also, rejected or disqualified. the Five Books of Moses (the first five books in the Hebrew Scripture). 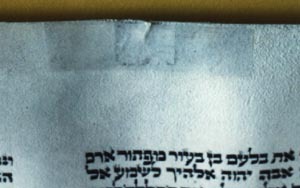 A Kosher copy of the scroll of the five books, or one that was kosher at one time. The five books of Moses if not in that kosher form, i.e. copied or printed in a printing press or any other version that wasn't meant to be kosher (and so can't be read to the congregation as part of the religious ceremony) is called a "chumash". the Hebrew word for scribe. four handwritten excerpts from the Sefer Torah placed in leather boxes which are tied around the forehead and bound to the hand & arm of a Jewish man at his weekday morning prayers. 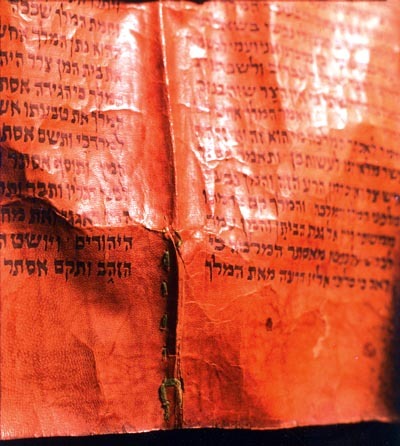 an exemplar, or master copy, from which a Sefer Torah is copied. a sheet of parchment used in creating a Torah. Approx. 65 yeriah are used to make one Torah. Clive Silverman at Kibbutz Beit Rimon, D. N. Hamovil 17950 ISRAEL. Appel, R. Gersion. The Concise Code of Jewish Law . v. I. Ktav Publishing House, Inc. New York, 1991. Chill, R. Abraham. The Minhagim . Sepher-Hermon Press, New York, 1979. Cohen, Shaye J.D. From the Maccabees to the Mishnah . The Westminster Press, Philadel	phia, 1987. Danby, Herbert. The Code of Maimonides: Book Ten: The Book of Cleanness . Yale University Press, New Haven, 1954. Ginzberg, Louis. The Legends of the Jews . Vol. IV. The Jewish Publication Society of America, Philadelphia. 1941. Helmreich, William B. The World of the Yeshiva . The Free Press, New York, 1982. Hyamson, Moses. Mishneh Torah: The Book of Adoration, by Maimonides . Boys Town Jerusalem Publishers, Jerusalem, 1965. Klein, Isaac. The Code of Maimonides-Book Seven: The Book of Agriculture . Yale University Press, New Haven, 1979. Pollak, Michael. The Torah Scrolls of the Chinese Jews . Bridwell Library, Dallas, TX, 1975. Ramirez, Anthony. "Renewal for a Storm-Scarred Torah." New York Times , 30 November, 1998. Ray, Eric. Sofer: the story of a Torah scroll . Torah Aura Productions, Los Angeles, 1986. Reed, R. Ancient Skins, Parchments, and Leathers . Seminar Press, London, 1972. Rosner, Fred. Medicine in the Mishneh Torah of Maimonides . Ktav Publishing House, Inc. New York, 1984. Vermès, Géza. Discovery in the Judean Desert . Desclee Company, New York, 1956. "The Conservation of the Dead Sea Scrolls in the Israel Antiquities Authority Laboratory." Originally published in: Leather Conservation News , Vol. 14, No. 2, 1998. The author is interested in hearing from any conservators who have been asked to restore a Torah scroll, or other sacred Jewish writings on parchment, and learning their decision. This information will be shared with the individuals who reviewed the current article, and may form the basis for a subsequent article.